Drinking a cider cup made of cider from an Ohme cider cup. What could be better? 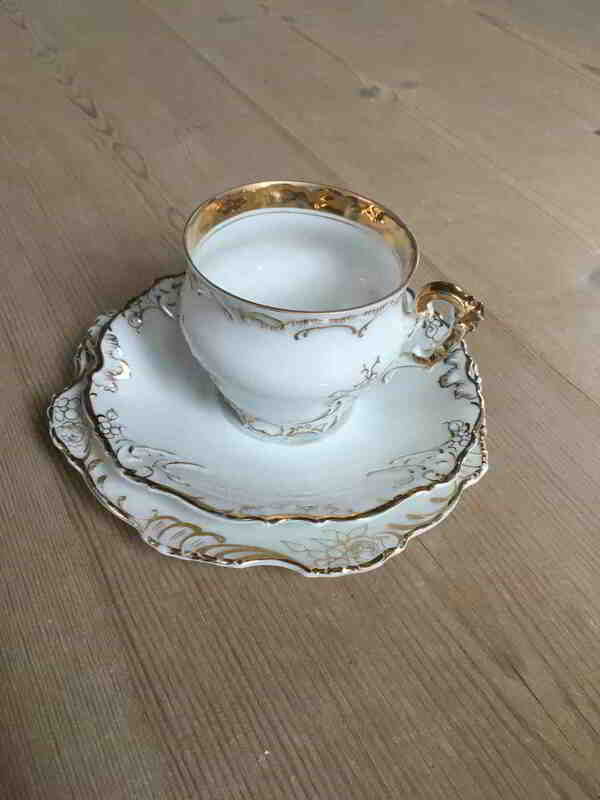 Lene, a visitor to the SOIOP website from Denmark, inquired about the Ohme Elysee cider cup and saucer, and matching Eglantine dessert plate shown in the photographs below. 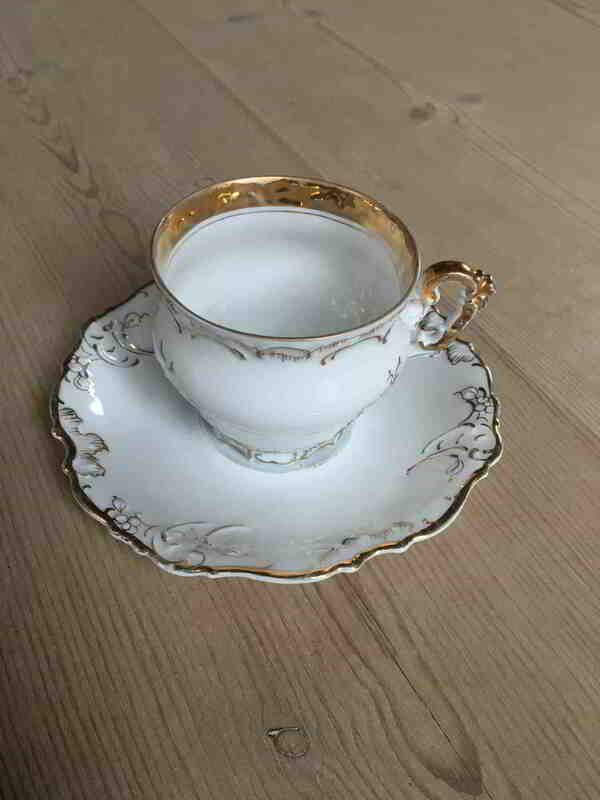 Alma Hillman et al "Old Ivory & Ohme Porcelain The Mystery Continues" reports that the cider cup was originally intended to go with a punch bowl but are also frequently found with chocolote and tea pots. The pattern for all the pieces relies on highlights of the mold. This is particularly effective with the Eglantine plate. Note how well the Eglantine rose jumps from the plate - very striking, and a testament to Ohme's attention to design detail. In looking up the cider cup, I noted there is no example of an Eglantine cider cup. Do they exist? 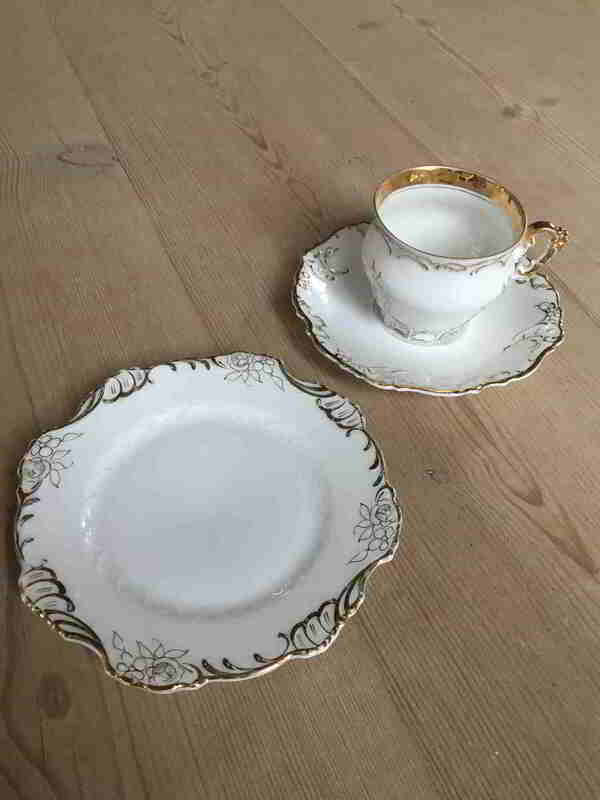 Perhaps this was an Eglantine set and the Elysee cider cups and saucers were used to complete the set. Maybe the pieces were purchased separately white, and later decorated. No matter! Responding to Lene's photographs got me curious about cider cups and cider in general. 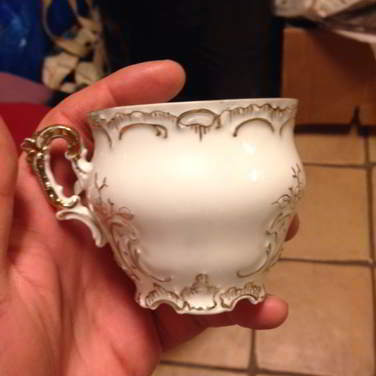 The earliest examples of cider cups I found were from 18th century England. Not surprising perhaps, this indicates cider - the fermented juice of the apple - has been a staple beverage for a long time. And Wikipedia says the UK has the world's highest per capita consumption of cider. The apple-harvest is over at last. The closing days of October saw the end of the in-gathering, and the general verdict of the Trafalgar crop is, "Good but small." The vintage of 1905 will be distinguished by high quality rather than by abundant quantity, that of the previous year having been in both respects almost a record one. 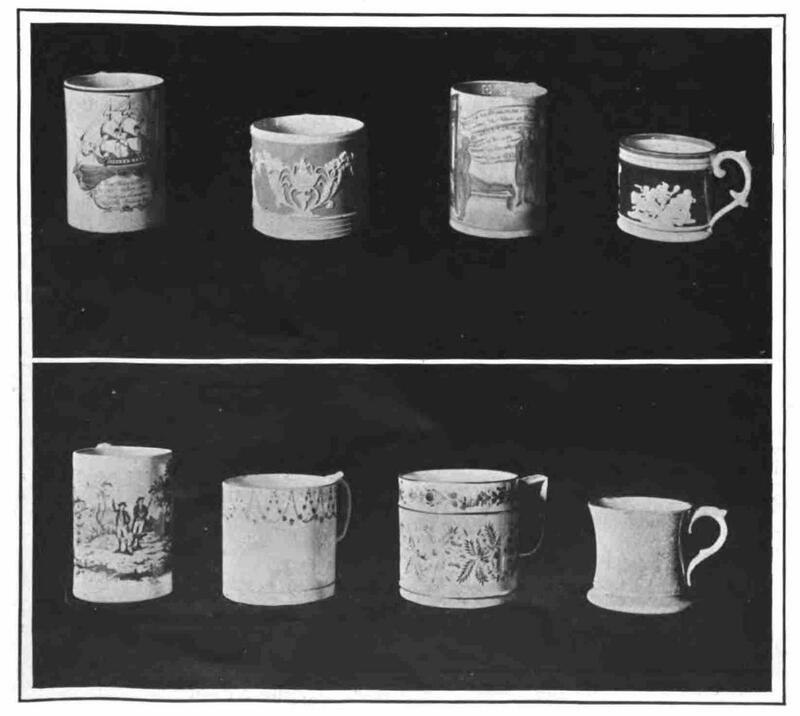 The cider-mug of porcelain or earthenware is the licensed victualler of the West what the pewter of three generations ago was to this confrère of the East and South. Now that cider has obtained brevet rank as a wine in all the great London hotels and restaurants, and that there is a steady demand for pure cider from Khartoum to the Cape and from Tokyo to Gibraltar, a cider-mug cult may be confidently expected. Given the prospect of a "cider-mug cult" it is not surprising that the Ohme factory would make cider/punch cups! One type of punch generally lower in alcohol content than other punches is the cup. Cups are usually made with a wine, cider, gin, or liqueur base. Wine cups, sherry cups, champagne cups, cider cups, ale and beer cups - the variety is endless. This leads to the conclusion that cider cups may well have been served in Ohme cider cups! Put into a glass pitcher one tablespoonful fine sugar, a little water--dissolve; add the juice of half a lemon, a few lumps of clear ice, half a pony white curacoa, half a pony brandy, one pint cider, one bottle plain soda, two slices of lemon, two of orange, one of cucumber-rind, a few lumps of clear ice; mix until cold. Add a few sprigs of fresh mint on top, stems down. Peel half a lemon very thin, and cut three slices of cucumber. Put these into a quart of cider, and set the vessel containing it on ice. Let this stand a quarter of an hour, then remove the lemon-peel and cucumber. Add half a wineglassful of liqueur brandy, the same quantity of curacoa, and two bottles of ginger-beer. This last must be added immediately before the cup is served. To make a Good Cider. - Take as much fruit (24 bushels to the hogshead of 63 gallons) as will make sufficient juice to fill a cask; mash into a pulp, spread the pulp so as to cover a large surface in the open air for 25 hours; press out the juice as clear as possible; fill the barrel up to the bung-hole, and keep it filled up as the fermentation proceeds, by adding fresh juice kept for the purpose; when the fermentation is ended, draw off into a clean barrel, which has had some brimstone burnt in it, by hanging an iron vessel through the bung-hole, and burning 1 draehm of brimstone in it; bung up tight, and keep the barrel in a cool place.